In qualitative marketing research surveys, keep your questions clear, concise, and conversational. Just remember the three Cs when you write and ask questions. Use words your respondents understand, and strip out useless words. Edit your questions to their most basic form, without losing meaning and precision. Keep questions simple by focusing on one idea. Avoid two questions in one sentence. Break a double-barreled question into two separate questions. Write questions from the respondent’s view. The ideal interview is when you ask a short question and the respondent answers several of your questions. It happens. Short questions get long answers. Let the respondents do the talking. Keep qualitative marketing research surveys or moderator guide questions simple. Write questions. Read them. Edit them. Then test them. Test your questions on one or two people, who typify the segment. It’s your pilot test. Your first focus group or depth interview in research project is a pilot test. Test for understanding. If people are confused about a question, rewrite it. If the question still doesn’t work, get rid of it. If respondents don’t understand your main question, ask it in a different way, or rephrase the question. If a particular question confuses people, vary it. When you start a new subject, you want to focus people on it. You take people back to an experience, behavior, attitude, or feeling. “Think back” or “when …” focuses attention on a subject. It introduces a subject. “Think back” or “When…” usually starts a main question, but you can use it as a follow-up question too. So, what is a good question in this business? Good questions are questions people easily understand. Good questions use words people recognize and know. Good questions are short, simple, and clear. They express a single idea. They avoid misunderstanding. Good questions answer the research objectives. In contrast, bad questions confuse respondents. Bad questions mislead and misinform. They deliver the wrong idea. They are off context. Bad questions bias answers. Bad questions put words in people’s mouths. Bad questions are leading questions. And bad questions threaten and irritate respondents. Bad questions shut up respondents. They stop people talking. Bad questions do not answer research objectives. They are off target and irrelevant. They produce answers the interviewer misunderstands and misinterprets. Keep qualitative marketing research surveys or moderator guide questions simple, and avoid confusion and misunderstanding. Keep it clear, concise, and conversational. Also, read the article about how to write basic questions for the focus group questionnaire. Check the article about question bias. 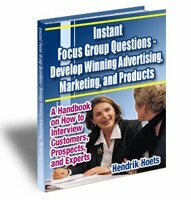 Instant Focus Group Questions e-book is packed with hundreds focus group questions. Click on the e-book to learn more now.